Our company is engaged in the manufacturing and supplying of a wide range audio visual equipment, public address systems, multimedia projection screens, portable public address systems, interactive board, interactive slate, classroom podiums, multimedia conference systems, audio visual equipment, multimedia projectors, overhead projectors, conference systems, portable pa system, ceiling kits, conference systems, language lab equipment, writing and display boards and projection screens. These are stringently tested for optimum functionality before getting delivered at client’s end. 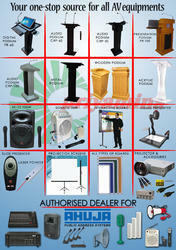 Our range caters to the requirements of various schools, colleges, railways stations, airports and shopping malls/cinemas.